Terriers face Harvard for the second time this season in tonight's Beanpot Consolation game at TD Garden. Puck drop is at 4:30 p.m. 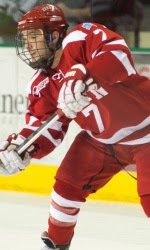 Junior Cason Hohmann (photo) is BU's top goal-scorer and, since returning to the line-up after a shoulder injury, has scored six times the past 10 games. Defenseman Ahti Oksanen tops the Terriers in points with 20 and assists with 15. Sophomore Jimmy Vesey leads the Crimson offense with 11 goals and 17 points. Splitting time in the Harvard net are Raphel Girard (2.63 GAA) and Steve Michalek (2.62). Sophomore Sean Maguire, recovered from the flu, will start in goal for BU. Here's the Terrier line-up. 2014 recruit JJ Piccinich scored his USHL-leading 12th power play goal in Youngstown’s 3-1 win against Muskegon Friday night. His 41 points (22G, 21A) is ninth best in the USHL. 2015 recruit Shane Starrett (photo) stopped 38 of 41 shots as the Portland Jr. Pirates completed a two-game sweep of Connecticut with a 4-3 win over the Yankees on Saturday. The previous evening Starrett turned aside some 30 Connecticut shots including a breakaway as the Pirates edged the Yankees, 2-1. In the U18 Five Nations tournament in Dmitrov, Russia, Team USA defeated the Czech Republic, 3-2, for a perfect 4-0 record and the tournament championship. 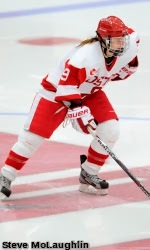 2014 recruit Jack Eichel’s assist gave him a team-leading seven points (3G, 4A) during the four games and 53 points in 33 U18s games. 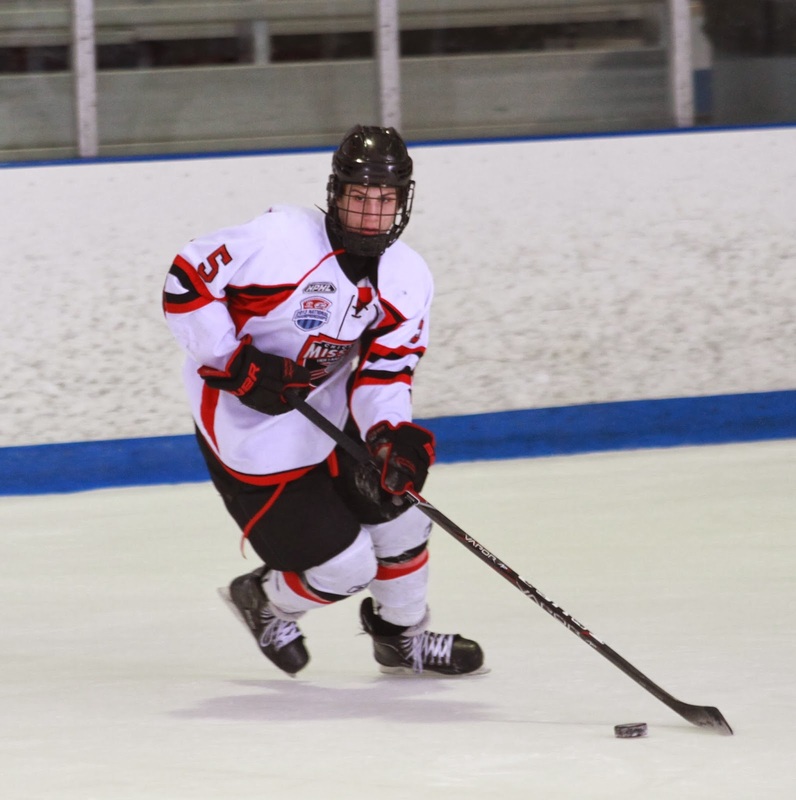 Fellow 2014 recruit Johnathan MacLeod (photo) finished with a goal and an assist and has six points (2G, 4A) this season. The NTDP U17s also finished 4-0 in their Five Nations tournament in Sundvall, Sweden. 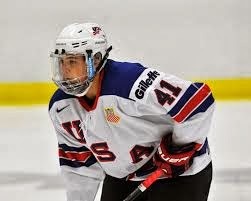 2015 recruit Charles McAvoy assisted on a goal in the 4-1 win over the host team finished the tournament tied for the best plus-minus with +6 for the four games. 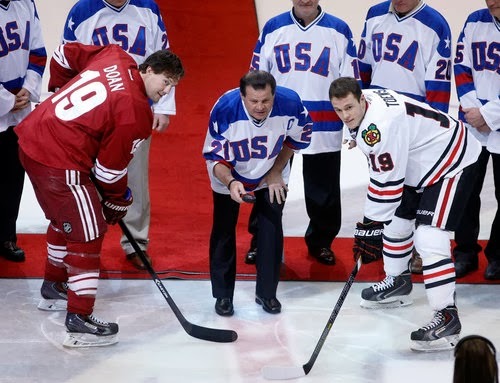 Mike Eruzione and Dave Silk were among 10 members of the 1980 U.S. Olympic Hockey Team who were honored during Friday night’s Blackhawks-Coyotes game in Arizona. The event was a send-off for the 15 players on the two NHL teams who will be going to Sochi for this year’s Olympiad. David Warsofsky assisted on the Bruins second goal in a 7-2 rout of Ottawa when his pass to the slot was deflected home by Rich Kelly. Adam Clendening assisted on a pair of goals in Rockford's 5-4 win against Utica. The blueliner from Wheatfield, N.Y., has five assists in his past three games and has 38 points in 50 games for the IceHogs. Sarah Lefort (photo) scored four goals and assisted on another to leader the Terriers to a 7-4 win over New Hampshire at Walter Brown Arena. Lefort leads Div. 1 with 26 goals and eight game-winners. The victory improved BU’s record to 12-5-0 in Hockey East and 19-9-1 overall. Louise Warren, Jordan Juron and Maddie Elia also found the net for the Terriers, while Kerrin Sperry notched her 80th career win with a 34-save effort. Former Terrier Tara Watchorn banged home a power play goal while Marie-Philip Poulin—taking a year’s sabbatical—scored a goal and an assist as Canada blanked Switzerland, 5-0, in a preliminary round game. Is Starrett a 2015 recruit now? or was that just a typo in the post?